Hey there! 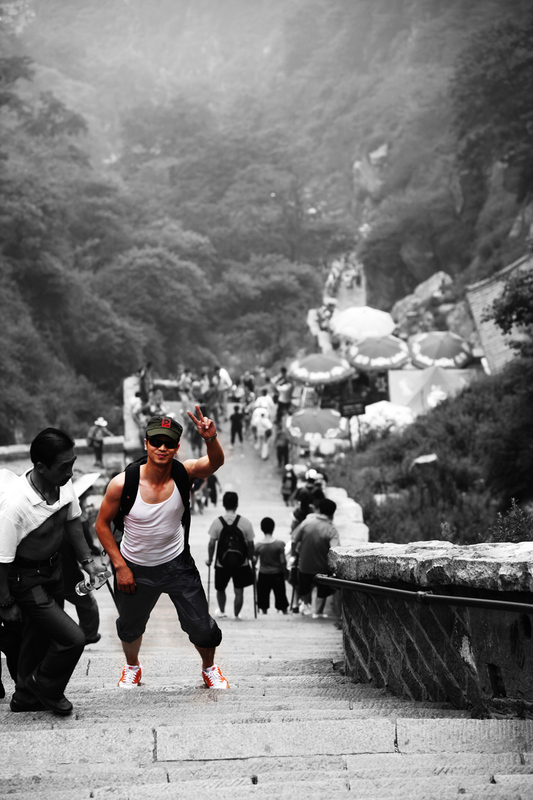 Thanks for dropping by Engineering a trip to China! 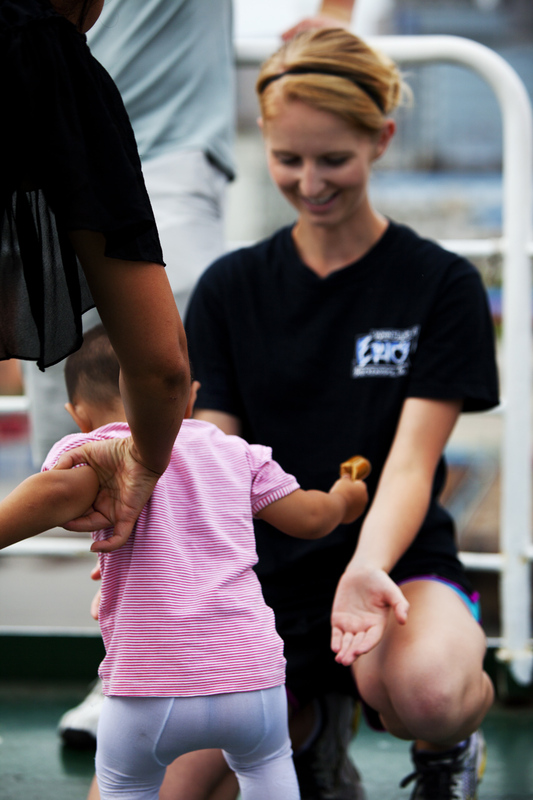 Take a look around and grab the RSS feed to stay updated. See you around! I’m moving the content on this site to http://www.supermanwah.com. I’ll be cataloging my work to this point, hope to see you there! Check out the trip photos here. You can use whatever you like, just make sure credit is sent back this way :). 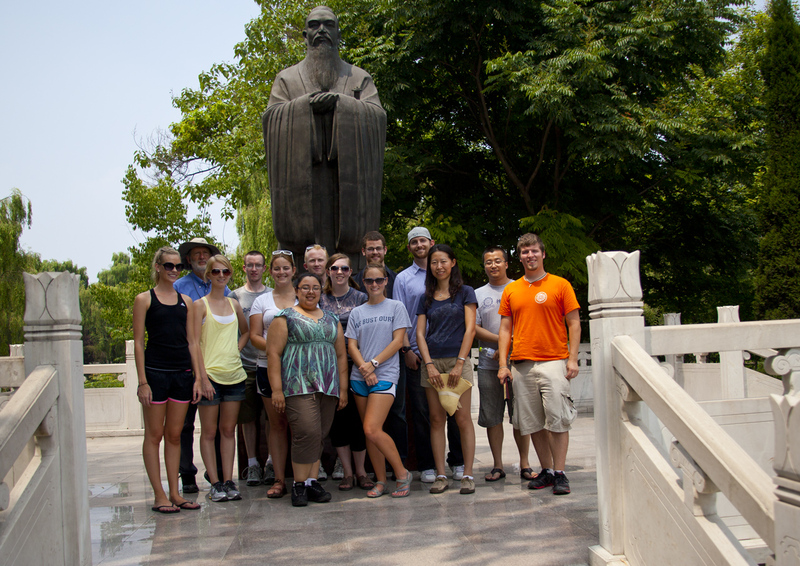 In the morning, Professor Mitcham and a group of students (including myself) went to see the corpse of Chairman Mao. The idea of preserving a corpse and displaying it publicly seems ridiculous to an American, even the Chinese Still, there we were standing in line with thousands of other Chinese for nearly two hours that zigged and zagged all across an area of Tien’amen square. The constant barrage of Chinese with bullhorns yelling in Chinese for us to ‘keep moving!’ was distracting, though by the end I could mock it well to a few chuckles from the Chinese around our group. Mao’s corpse is held inside a rather large building that looks like the entrance to a large museum, except only for one man. The security was tighter than any of the other locations we had visited, hands down. We went through multiple security screens, and x-ray checkpoints. The viewing is short; you are only allowed 10 seconds in the room with Mao. He is behind thick glass with a glowing yellow light on his face as he lies in a wood coffin-like structure with the rest of his body from the waste down under the lid. The mood in the room is eerie and somber, but mostly respectful. All of us agreed his corpse looked fake, like a wax figurine. We also considered the possibility his body is heavily preserved, but as in most things in life, the simplest answer is likely the correct one. It was an interesting experience that I can say “yup, I did that,” but one I would be unlikely to repeat on a subsequent trip to China. Next a few of us caught the Metro to meet up Wan Nan for a trip to the foreign market shopping mall so we could all pick up souvenirs for our family and friends. The place had 6 floors packed wall to wall with the best knock-offs I’ve ever seen; the loose Chinese trademark law in obvious effect. We found it interesting that none of the items had the typical “Made in China” markings typical of goods made in China for export. The rule of thumb with the Chinese in most of the shops, according to our guide, was to offer 1/6th of the price or more as a starting point, and never agree to anything under 1/3rd of the starting price. It seemed strange at first, almost insulting offering someone 1/6 of their asking price. The Chinese are excellent barters and worse than car salesman in trying to extract as much capital from your wallet as possible if you’re unknowing of the cost of products. There seemed to be at least two or three distinct economic systems at a play in the this ‘mall.’ The vendors seemed to have colluded to a degree in that the prices were ridiculously high, but for all vendors. In economics this is something like “price protection” and the organization collusion a form of a “cartel”. Price collusion is illegal in the US as it encourages inflated market values as well as monopolistic market behavior. The initial prices reflected this theory, though once bartering started, the market value determination system seemed to play a bigger role. You look at product you are somewhat interested in, say a dragon figurine. The Chinese sales person, watching you like a hawk, jumps in and begins her sales pitch (I just realized, the majority of the vendors were women). So the game starts. The first tactic is to tell you how ‘authentic’ the item is. They then demonstrate the products ‘authenticity’ by placing a lighter flame under the item. I assume they are trying to show it’s not plastic or polyethylene, thinking somehow America engineering students from Mines are idiots. The next tactic is to tell you how much you like it. This one always made me laugh out loud. I think I know how much I like something; it’s me after all. You then ask their asking price and, hoping you are an idiot, they offer something like 800 Yuan. (the exchange rate is around 6.4 so we typically would use a ‘divide by 6’ to convert to American dollars as a rough guess). So at $133 dollars using the guess formula, your first reaction should be a genuine laugh-out-loud, (or a simulated one, works well on the stuff you have no IDEA what it should cost). Recognizing you don’t have the mental capacity of a vegetable, but being hopefully optimistic that you are mildly idiotic, they drop the price 100 Yuan saying “I will give you a discount, you’re my first customer of the day!” (even though someone else in your group just picked something up from the store). Laugh again. Then counter offer at something around 1/12h of the price. This is difficult at first because it seems insulting and ridiculous, but it will become easier with some practice. What happens next varies widely. Sometimes they will act insulted and tell you how authentic their product is, and that their ‘family’ will lose money on the transaction. Others will laugh (much like you did initially) and say ‘you must have a fever!’ Some will say their shop is too expensive for you, or that you don’t understand how much it takes to make something. Others will say, “you must be joking! I will lose money!” The good ones will just tell you to leave, and grab you last second or ‘call a manager.’ After a few minutes of them groaning, they ask, “what is your final price, final price! 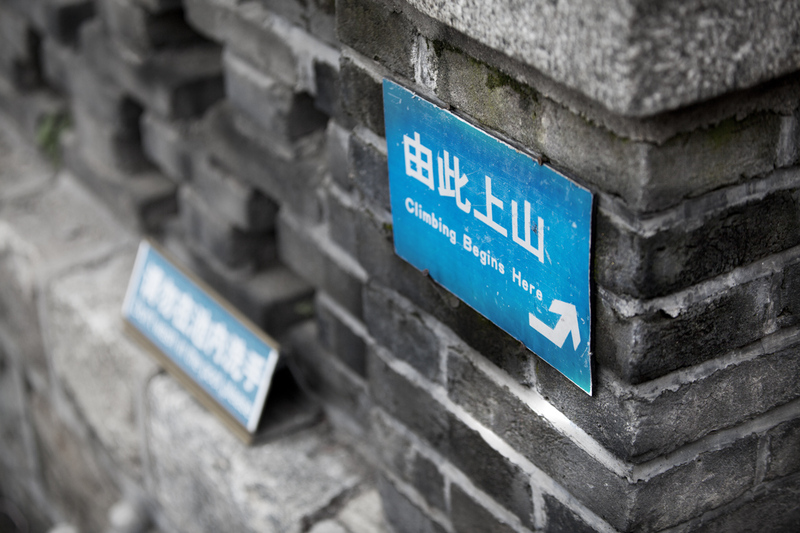 ?” You should repeat what you said, or maybe give a 10 Yuan bump. The vendor will not appreciate your stubbornness, trying to ask you for a better final price. This is when you put the item down, and say, “I wasn’t THAT interested in this, I was just looking, thank you!” very politely and start leaving the store. Walk slowly away and listen for the exponential drop in price that is proportional to your distance away from the store. In the first 3 seconds, of you leaving, the price will drop 1/2th of the original. A few seconds later, another 1/2 goes. Within a few more steps, they finally say “Ok, I will do your deal!” Some of the vendors snap out of their hard sales mode and become very friendly, other’s stay a bit angry that they couldn’t extract more of your wallet. The trick is to not be too attached to whatever you are looking at. This would never fly in an American store; the price is the price. What I also found was that before the sale, there is little honesty. Every ‘price’ they tell you is their ‘best price,’ and all of them try to convince you things are ‘real stone’ when they are not, or a ‘real’ bag when it’s obviously a knock off. However, after the sale, I can hand the vendor large bills and expect exact change. 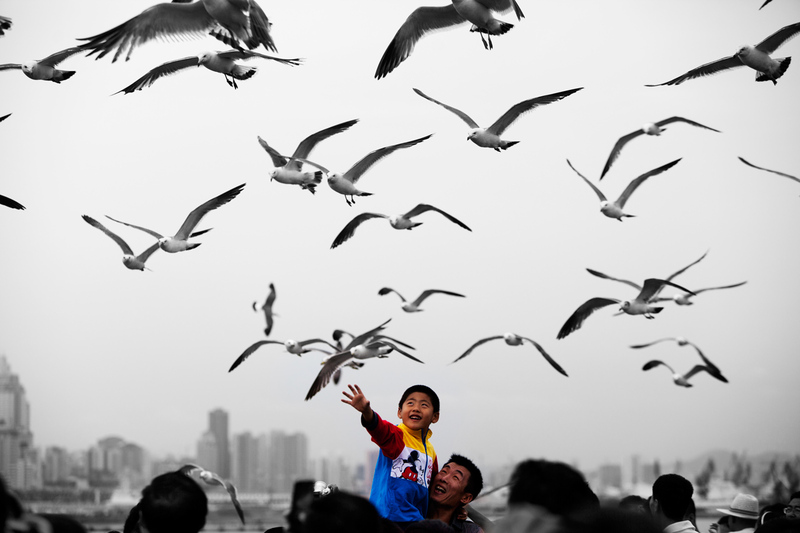 The Chinese think of the transactions as a sort of game in and of itself but once the transaction is complete, the majority show their true kind personalities and were for the most part quite lovely. Finalizing the price was always my favorite part, after wards we were almost as friends, and they would tell me of their family, ask about our trip, and seem genuinely interested. We would laugh and enjoy one another’s company, much like the experiences we had with the academic elite at DUT as well as the very lovely Chinese people on the streets. The curious element in the whole shopping ordeal is the very high starting price. No one pays it, so there should be downward pressure on the price from the consumer to purchase the good. A store selling 10% over cost would make a killing in a market like that, selling out entire stocks of goods. But with the agreement of the vendor ‘cartels,’ there seems to be a unanimous agreement not to do this. There must be some incentive to do so, perhaps unsuspecting shoppers are caught in the snare of the high price at the top of the supply/demand curve, thus allowing for a much larger extraction of consumer surplus. Today was the day the words our friends from the Brooklyn’s bar spoke really seemed to take hold. To an extent they were right, these guys are ruthless in business. Even with the inflated starting prices, the goods are incredibly cheap. We picked up excellent knock-off shoes of Nike, Ecco, and Addidas for less than $12 US. T-shirts were in the $5 US range. We picked up 5ft scroll paintings, originally painted (but copies of master works) for $7 US. In the end both vendor and customer felt they were getting very good deals. My final advice is to go in groups. 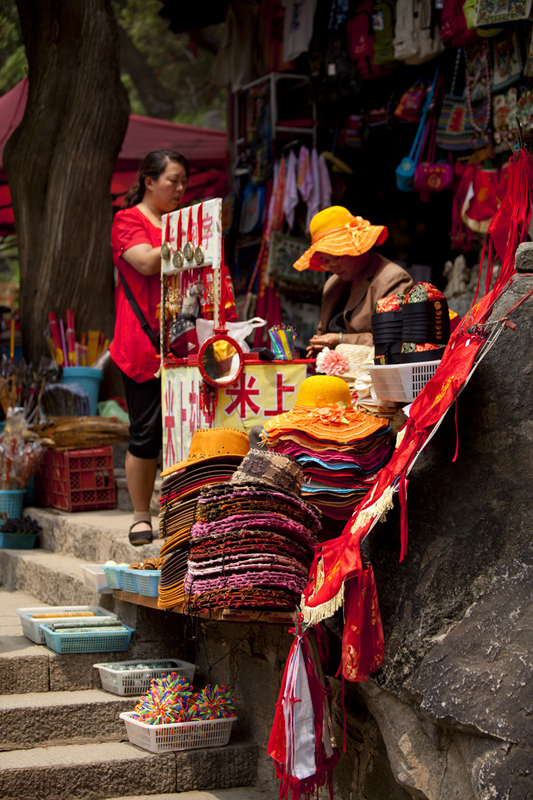 Once one person does the haggle work to get a reasonable price, the Chinese will accept this same from any friends of the haggler, thus saving you lots of work! These bargaining techniques are required in all the shops, but did not apply to the grocery market stores. I couldn’t imagine how difficult doing actual multi-million dollar deals would be. You would absolutely need to know your products and be able to call a bluff when you see one. Poker players should consult businessmen working in China apparently :). 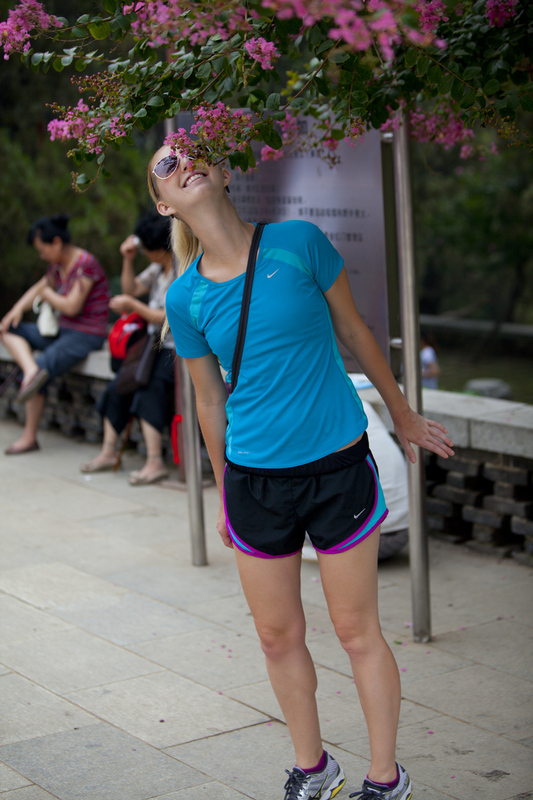 After nearly three weeks in China, my perceptions of the country had begun to conform into a somewhat cohesive ideal. From the academic intellectuals, we could see how much internal inflection or self-cultivation was a factor of their ideals. I had an idea of how lovely the Chinese people were, how ambitious they seem to be becoming, and how important Daoism and Confucianism thought was to the sentiments of the Chinese people. I had been able to form criticisms of infrastructure problems China looks to have and the facades of materials used in construction. For example, buildings that looked to be made of brick were at close inspection actually plaster painted to ‘look’ like brick (quite offensive to a Bauhausian such as myself). What completely altered my opinion of China and ultimately gives me a very strong hope for the openness that I think is coming for the country, was the artwork itself. There was more progressive art and design in the 798 district than anything I’ve seen in Denver, New York, or anywhere I’ve traveled or have seen in the world. The pieces ran the gamut – on one had there were beautiful oil paintings with extreme skill, expertly crafted sculptures and on the other, grotesque works with naked figures and extremely suggestive, even offensive works. The explosion of expression we were experiencing was tantalizing and the air was electric everywhere you went. I loved it. It was hard to believe; I found myself dozens of times saying, “Are we really in Communist China?” If the government is accepting, or at least tolerant of the movement going on here, China is on a very bright path indeed. 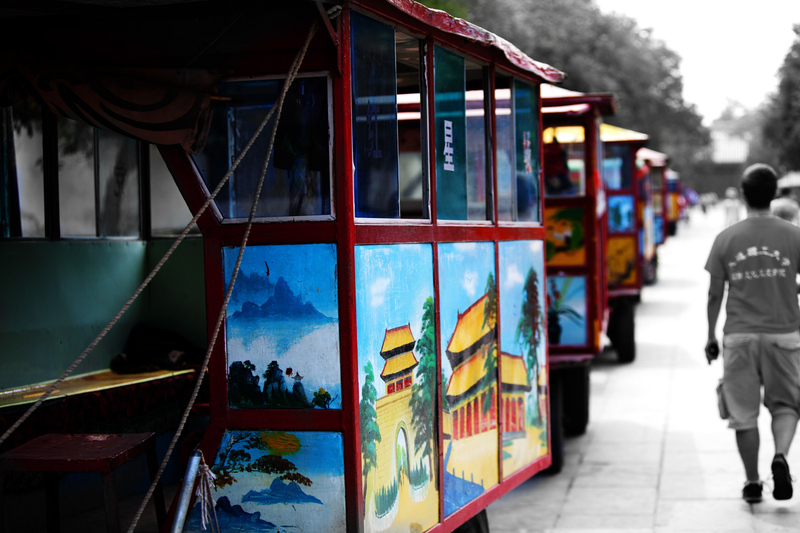 I loved the 798 district and it is a MUST see for anyone visiting China. 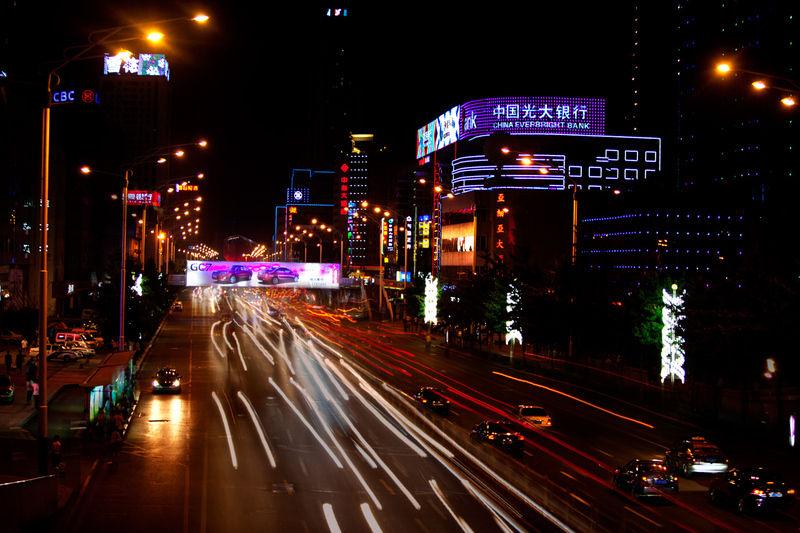 A few words on Beijing and in general, traffic in China. First, crossing major streets in China takes some getting used to. The people literally just walk out into incoming traffic, fitting between the cars as they pass by. We were terrified! Even in the areas that had walking signals, the cars disregard them. It’s ridiculous at first, but by the end of the trip, we were all fairly comfortable with the idea of stepping out into traffic, literally playing frogger across the walkways to get across the street. 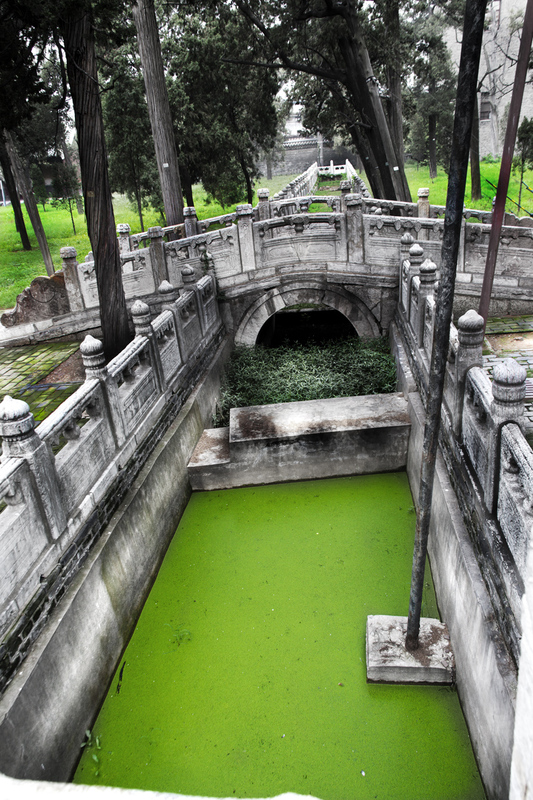 Second, the sewer systems in China are really pretty bad. Dalian was better in some cases but for the most part, they were similar. 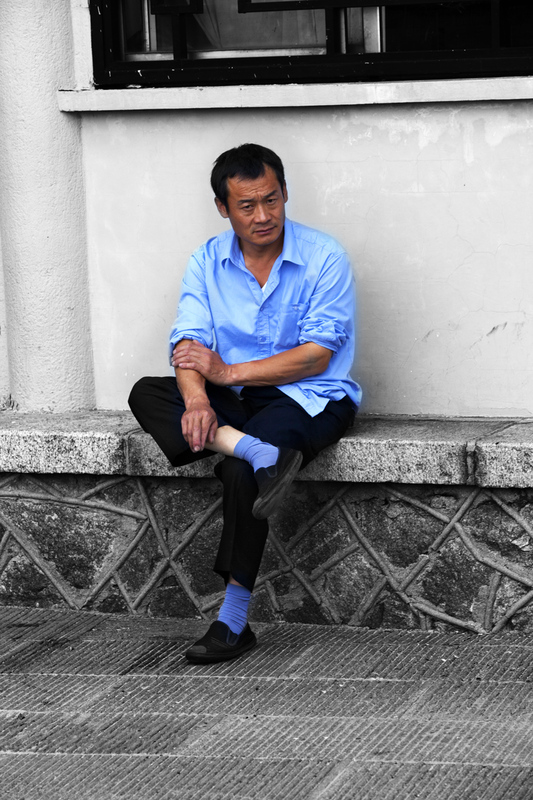 As what became characteristic in walking the city streets in China, the sewer smells would come, choking walkers by with the smell of urine and waste, and then away it would go. Of course after the insane rain that came later that day, there was huge flooding in the city. Apparently it was the worst rain in 60 years. I shot a quick video with the incredible 5d Mark II as an HD test, it turned out amazing. 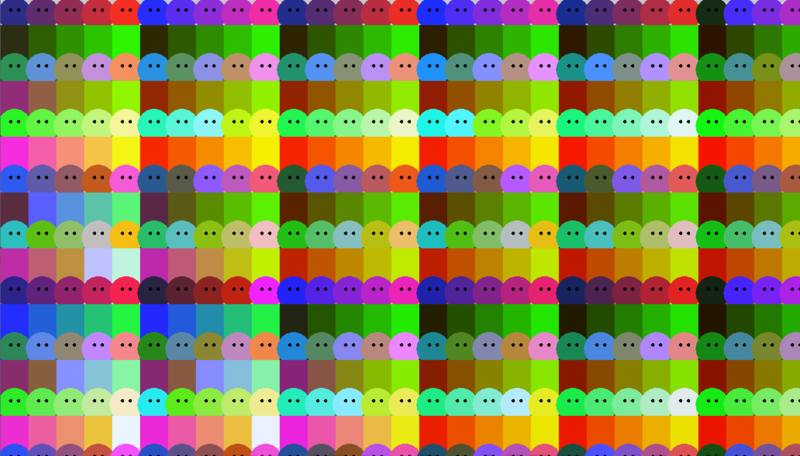 Watch it in 1080P full screen. Really, other than the heat in Beijing, that’s all I have to critique about China. 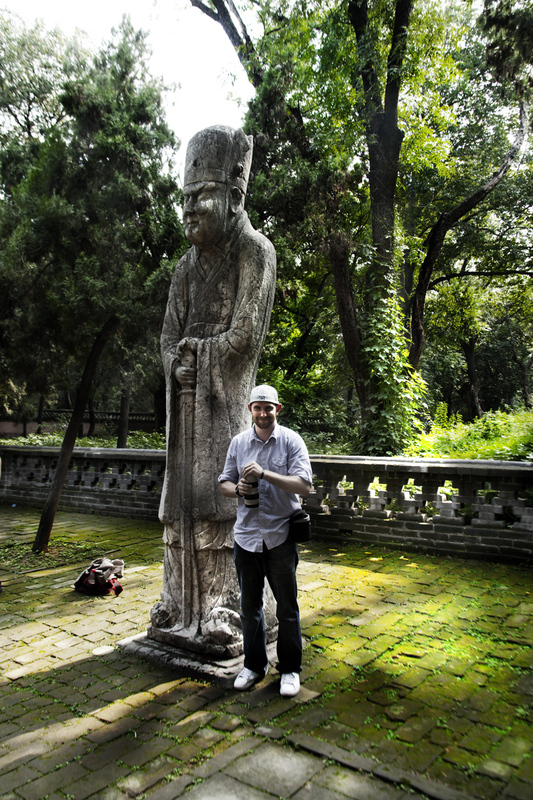 The people are still very welcoming, the food is amazing, and the ancient sites in Beijing are beautiful. More pictures coming soon! Today was our first true experience with the large Chinese population as we visited Tien’amen square and the forbidden palace. The amount of people pouring into the Tien’amen square and the palace was overwhelming. In sweltering heat combined with high humidity, it was a sweaty, sticky, tiring day. First a word of caution, when doing an outdoor event in China, do not wear bright yellow :). Apparently, the bug population in China is attracted to the color like flies to sh… well you know… In all honestly, I likely killed 200 small bugs that decided to take their landing on my very yellow shirt. It was pretty disgusting, but China has a way of getting you over these things :). In a testament to how far China is moving in the right direction, Tien’amen square is nothing like it was in the past. Our professor explained a story on the last time he had visited the square. Due to the student demonstrations, people were not allowed to be in groups any larger than three. This sounds ridiculous but as the professor explained, he and two other colleges were walking through the square, talking to one another. A fourth college joined their group as the walked and within seconds, a guard was on them yelling to split the group up. 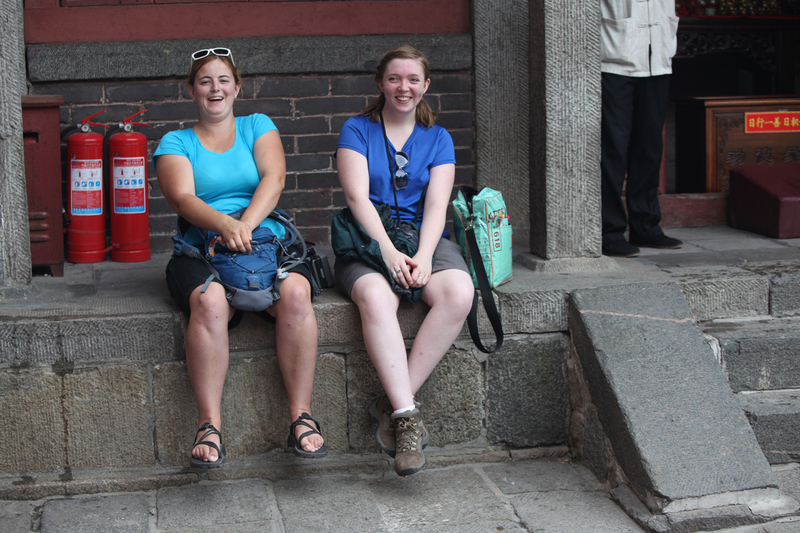 After getting our fair share of pictures in the square, we moved onto the Forbidden City. The grounds are huge, much bigger than the square though we could only travel to 30% of it. As a series of successive buildings linked by courtyards and beautiful gardens, the structure was awe-inspiring. Sadly because of looting, (most by foreign countries after the opiate wars) most of the precious treasure from the complex was stolen and now resides in British, French, and Dutch museums. The rock garden at the end was beautiful though due to the heat and mass of people, it was difficult to enjoy. 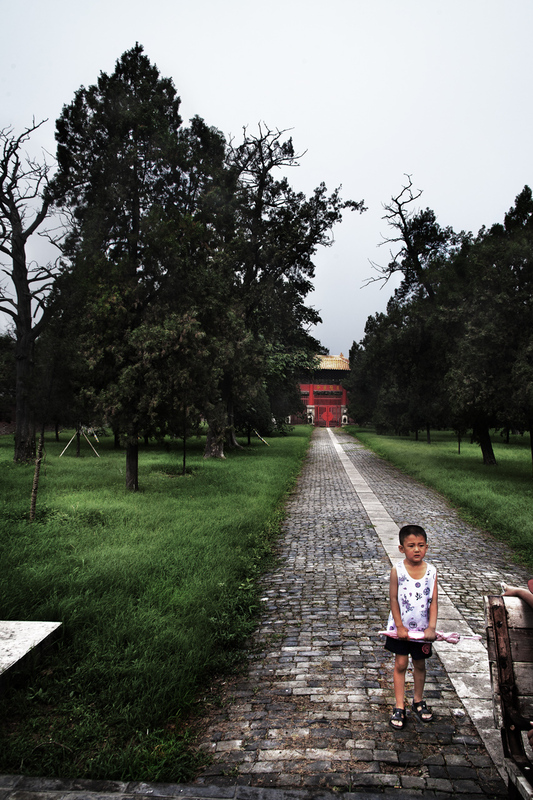 I missed the serenity of the Confucian Cemetery and Temples. 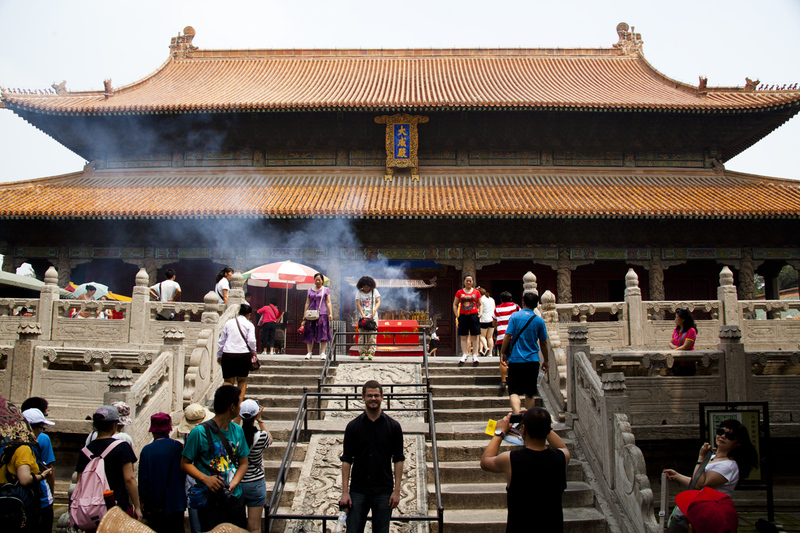 A note on that, the Forbidden palace, and many of the other locations we visited in Beijing, had much of the culture and original ambience intact. 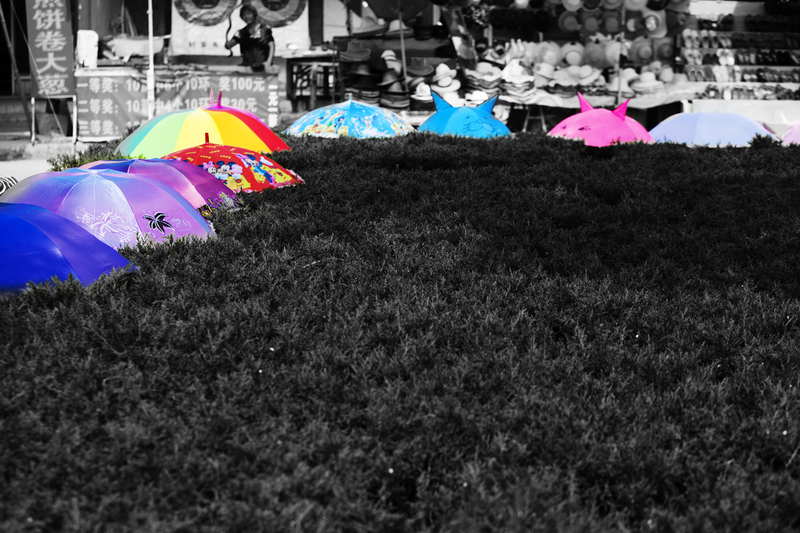 Though there were certainly shops scattered throughout the grounds, the commercialization of the portions we saw was kept at a minimum, much to our happiness. 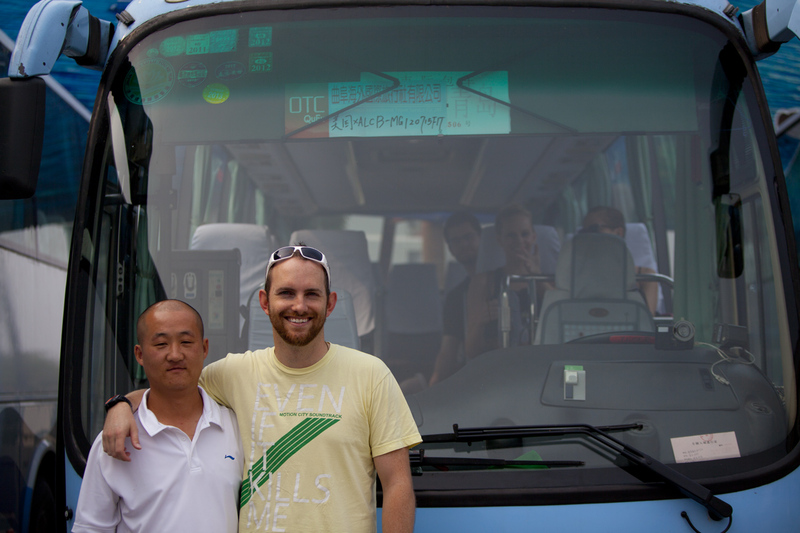 Today we left Tian and rode the bullet train to Beijing. A few quick thoughts. First, why in the world are we not using these trains in the US!? (I ask rhetorically, I know a big factor was Eisenhower’s influence on the road systems through our country). The ride was amazingly smooth, comfortable, and we moved across a large area in a third of the normal time. The train ran around 450km/hr (about 150 mph) and cut a 10 hour train ride to under three hours. It was sweet! Pictures of course were difficult to take of the countryside but I’ll toss a few sloppy ones up to get a feel. The countryside in this area reminded me of Ohio or Iowa, it’s very similar. One word on the Chinese, why do they constantly cut in line? More comically, why does it bother American’s so damn much? It started out as funny at first, but now it is a mission to barricade our places in line with high elbows and big backpacks. Today as we were waiting in line to get through security, a guy threw his bag on the x-ray conveyer on top of one of my own, literally pushed me to the side, and walked through the detector to be waved down by Hermione (a Chinese version of the Harry Potter character waving her metal detector-wand). It’s still quite funny actually, but the introspection question is still valid, why does it bother us? Perhaps it has something to do with the value of equality or fairness so deeply engrained in the individualism American culture. It’s not ‘fair’ that someone is treated specially and allowed to jump in line, thus violating my individual rights to that place in line. This is of course ridiculous, coming from a society that has the ‘special’ 1% of people controlling 95% of the wealth in our country. We are in the enormous city of Beijing now, and at 23 million people, it’s three times the population of NewYork. From where we are staying it’s difficult to tell, the cloudy, smoggy air hides much of the large buildings so perhaps tomorrow we can get a better feel for the large city. Aside from the sewer smell as you walk past the street grates, the city is remarkably clean according to our Chinese friends, the safest city in China. I would believe that, after walking around some, there is a large police and military presence in most areas we viewed. Tonight for dinner we had the famous Beijing duck. It was very good. We also had a little visitor that decided to take up a seat at one of our tables; he was very cute :). 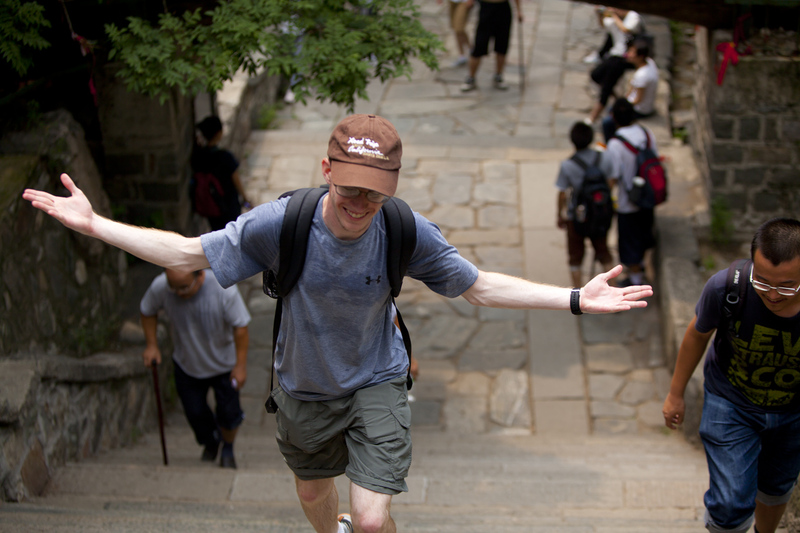 Today we climbed the 5,000 ft Tai Shan. Mt. 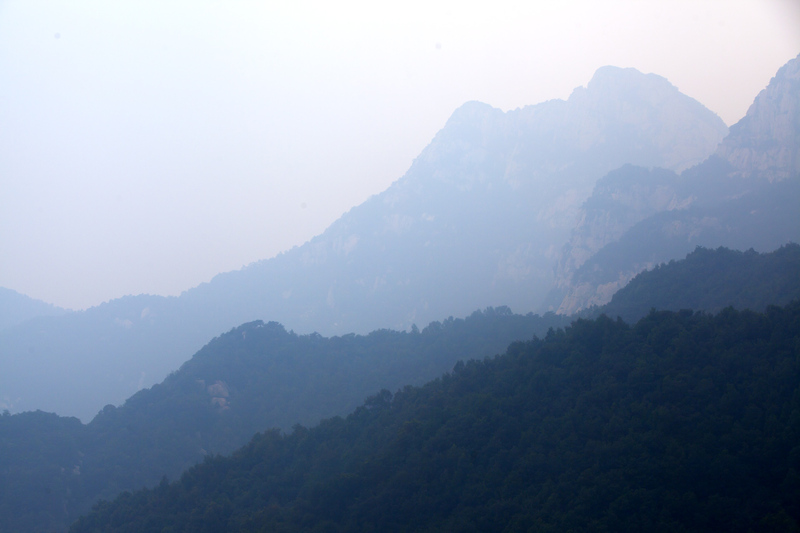 Tai (Shan means mountain) is one of the five holiest mountains in China. It has been in use heavily for the past 3,000 years as a center for religious pilgrimages and worship. The mountain has two paths that can get you to the top, one that starts about mid-way of which most tourists take, and one that starts at the bottom. Being native mountain climbing Coloradans, and strong willed American’s at that, how could we NOT start from the bottom? There were some that thought our ‘we can do anything’ spirit was a bit much so we split into two groups that started at each respective location. I can’t do much these days without thinking, “if you are going to do something, do it right” so I couldn’t help but join the long-walk group. This ideal of ‘doing it right’ along with the other ‘I can do anything’ are American sentiments I realized we as American’s take for granted; my Chinese friend Zhu Qin calls it the ‘American Spirit.’ I like it. I don’t mean the sentiment ‘I can do anything’ in the same light as our government does in invading Iraq or nuking a city full of children, but more in the sense that it is within my own power to fulfill my goals. American’s know what I mean. Like Hemmingway noted on his time in Paris, I have learned more about being an American by NOT being in America :). Anyway from the bottom the hike had us walking up 7200 stone steps – and that’s not a typo. It was a hell of a hike, and worth every stony step. Coloradans know the feeling well of hiking the famous 14’ers in our state and the gratification you receive by accomplishing a summit. The sentiment was the same, but instead you were surrounded by thousands of Chinese. 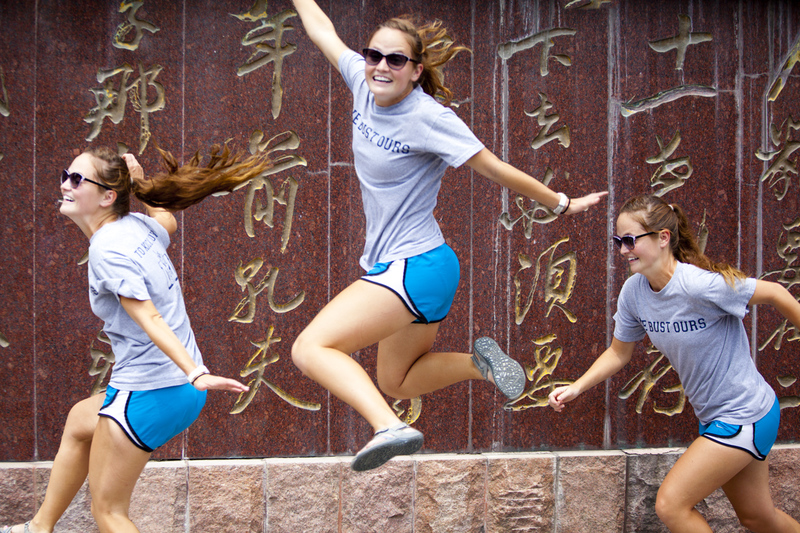 What I learned from Tai Shan is truly how much the same human beings are. For example, during the hike there wasn’t a single participant that wasn’t trying to help one another. We saw young boys helping elderly women and men up and down the climb, we witnessed parents encouraging their children, and then the rest of the lot encouraging everyone else. The spirit of encouragement was inspiring; it seemed natural and intrinsic to everyone’s human nature – a very encouraging thought. 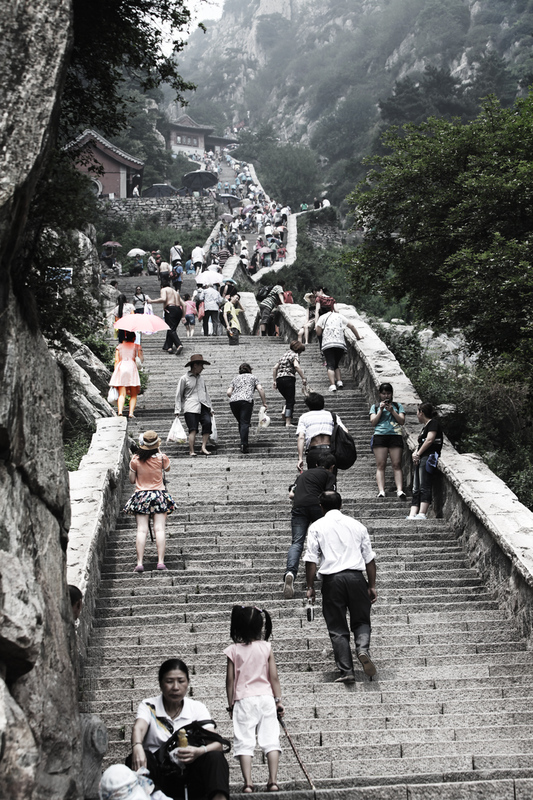 Though the mountain was extremely busy, you couldn’t help but be taken back by the awe of climbing stone steps that emperors, even Mao Zedong himself, had climbed. The base had us traveling along a well-maintained path through dense forest next to streams, waterfalls, and lush terrain. 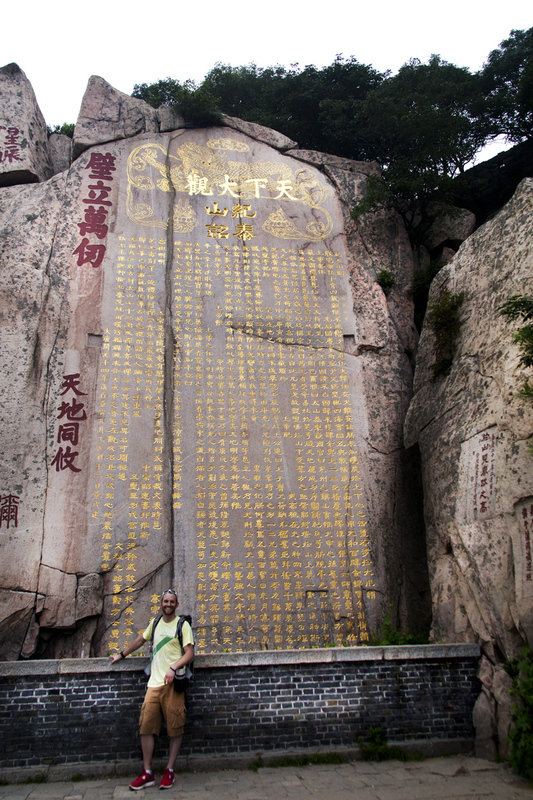 As you climbed, you were met with Chinese characters carved into the mountainside by dynasties (and other people), some thousands of years old. 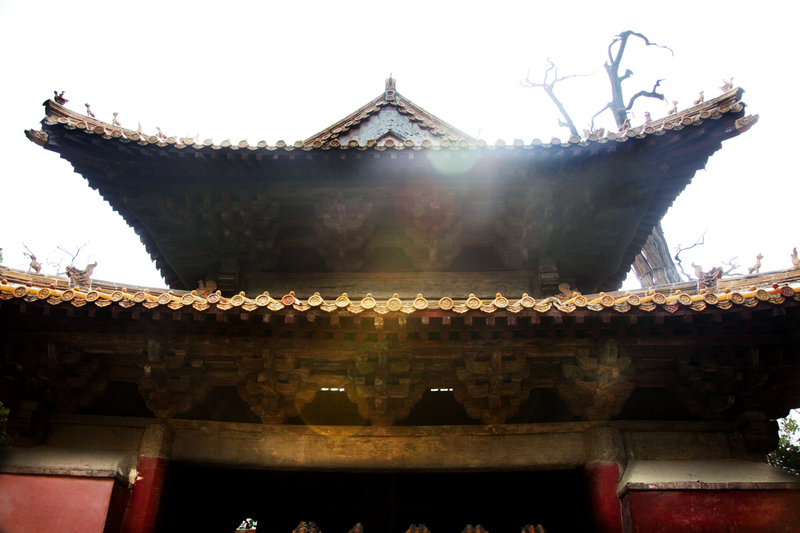 There were many small temples along the path as well, typically each belonging to a ‘god.’ Most of the temples were Daoist based deities, and though at first it seemed they were simply being preserved for everyone to see, it become apparent that these temples are still very much in use. These are functional temples. Many of the climbers would pay their respects by kneeling in prayer to the goddess of the mountain or the great Tai mountain god. Some would give you luck, other fertility, yet others wealth. 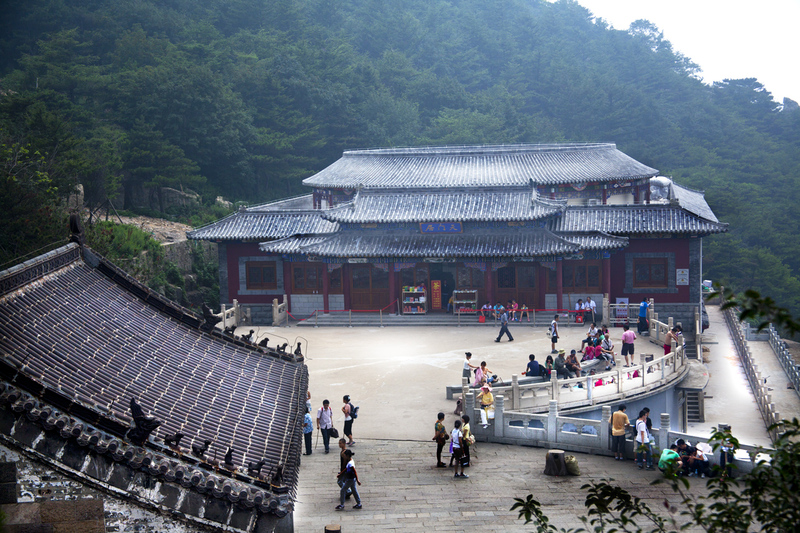 Once you reached the top, you were met with a huge complex of temple buildings that had unfortunately been converted into restaurants, shops, and even a four star hotel. 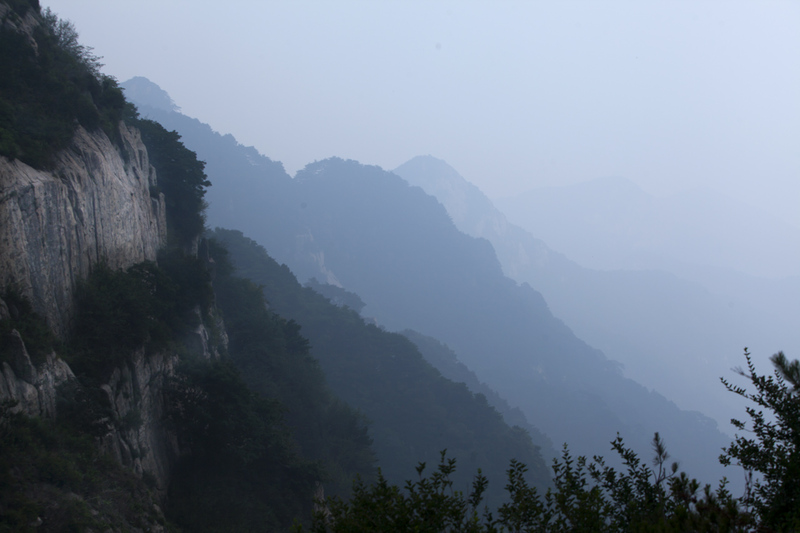 Still, the view was impressive, even through the thick fog (that seems to follow our group everywhere we go in China). Our group made it to the top in record time, and near the end, had passed the group that had started in the middle! Hats off also to Zhu Qin, our Chinese companion for taking the initiative to accompany us native Coloradans from the bottom. Even though he did some exchange work in Colorado, he hadn’t done much in the way of hiking or climbing there, and certainly not in China. 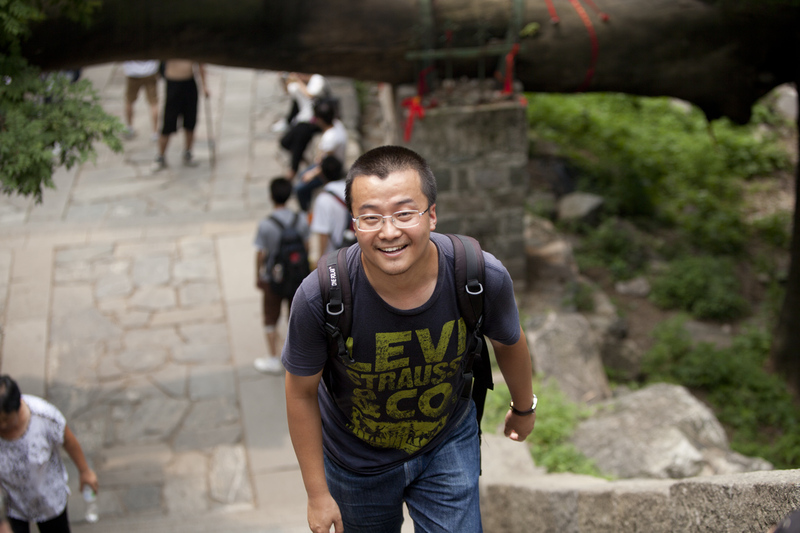 The hike was essentially his first and though we were a little behind the lower group (I stayed with Qin, which worked out great because I could take lots of photos! ), he totally killed it. Great job man, between you and Lilly, our group can’t help but be inspired by how bright China’s future is with you guys in it. The commercialization problem also reared its ugly head on Mt. Tai. Along the entire path were little shops, probably a hundred of them, to buy little trinkets and knick-knacks. I didn’t seem to mind the shops as much going up, but the ones at the top again had me irritated that such beautiful history was being exploited and mocked once again. The worst part was something I found out later. 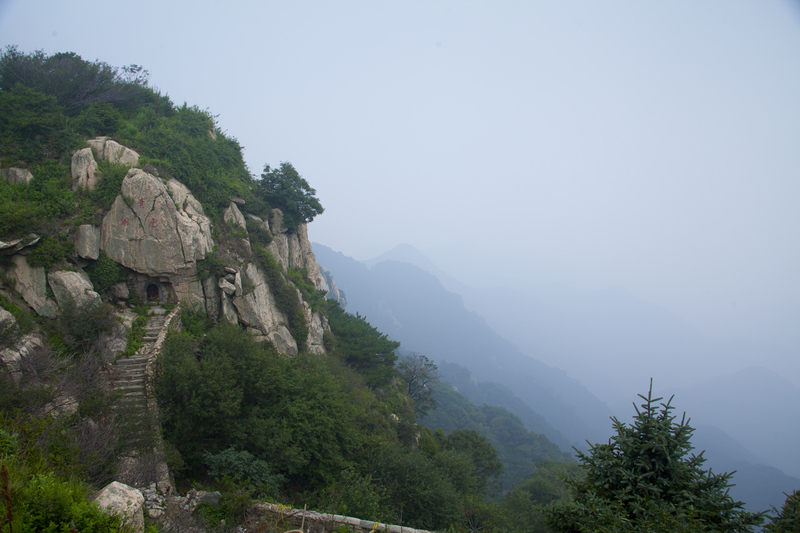 As I mentioned, there are beautiful Chinese carvings done right into the mountainside all along the path up Tai Shan. At one point, however, there was a string of characters that were a light blue, and were directly under an old set of carvings of which looked rather beautiful. Turns out, it was an advertisement for a travel agency, carved right there into the actual mountain. After returning to the bus for the day, I heard this and followed the news with a long string of curse words, almost as reflex. Advertisements carved into the most holy mountain in China? Are you kidding me? My blood is still boiling. 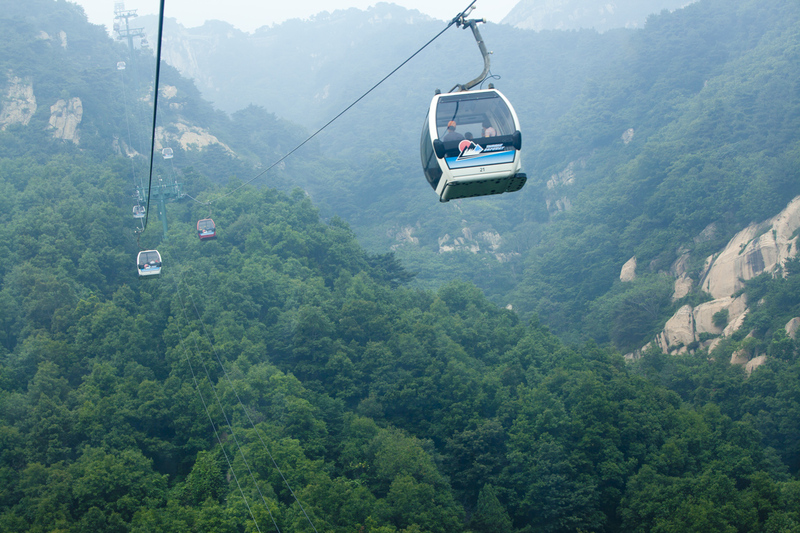 Anyway, the trip concluded with a rather scary, but much appreciated ride in a cable car back down them mountain. All in all the hike was beautiful, and I would absolutely recommend it to anyone visiting China. I maybe more sensitive to the commercialization than most, but am developing a sort of ‘tune out’ method that is also serving me well in some photography. It’s my goal to try and take shots that involve as little of the ‘noise’ as possible, focusing on the color that is really there with the people or places we visit. Our bus driver really wanted a picture w/ me, it was funny. This guy didn’t look to happy coming down. Bernard showing his bravado, the mountain is no match :). These two get stopped constantly in China, often even followed as celebrities. This was half way up the mountain… Ugh little late guys. 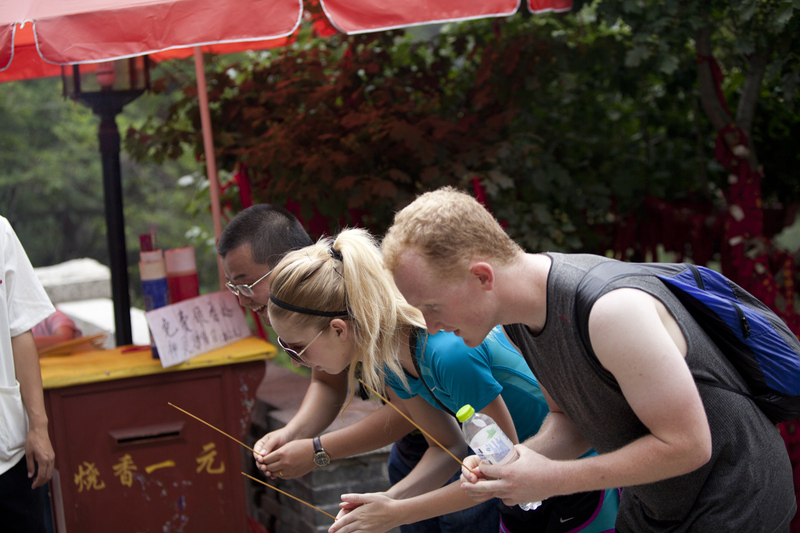 Qin, Katie, and Alex offering incense at one of the temples on the climb up Mt. Tai. Shot of a section of the stairs up Mt. Tai. I was shooting the stairs on this one, and didn’t even realize this guy was waving until I was home looking over pictures! Those are my favorite, random moments. All smiles at the top of the mountain. One of the complexes at the top of Mt. Tai. I want to see the Misty Mountains again Gandalf! This beautiful manuscript was inlayed with gold and was enormous. David and I found it by accident climbing past the building complexes near the top of Mt. Tai! This guy didn’t seem too happy sitting there. 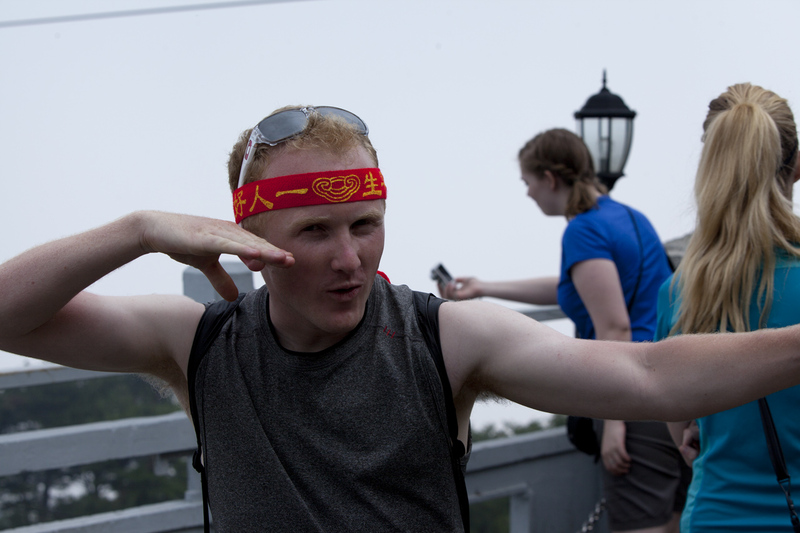 Alex found a bandana, and his inner kung fu. Misty mountains w/ a dose of pollution…. Cool pillars at the bottom of the gondola ride. This will be a long post, sorry Wen Juan Yin! 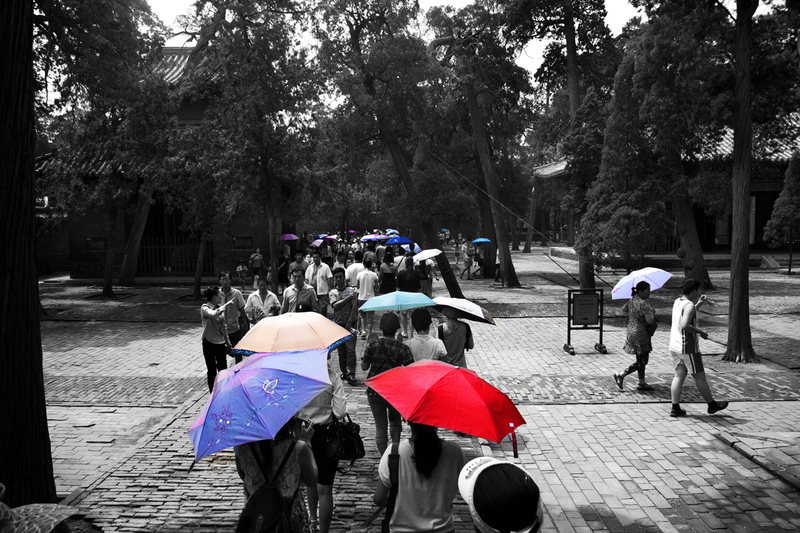 Today our group went to see the Confucian temple, the Confucian study center, and the Confucian cemetery in Qufu, the birthplace of Confucius. Kongzi (551 BC – 479 BC, pronounced ‘khong-zah’ ) is his name in Chinese and it literally means ‘Master Kong.’ Kongzi was from the peasant ‘Kong’ family, and aspired all his life to have an official post. Wise beyond his age, he died a poor peasant still, and was unable to attain the office he was searching for. His teachings now 2500 years old, were canonized almost immediately after his death and still permeate this nation; to say he was influential in Chinese culture is an understatement. 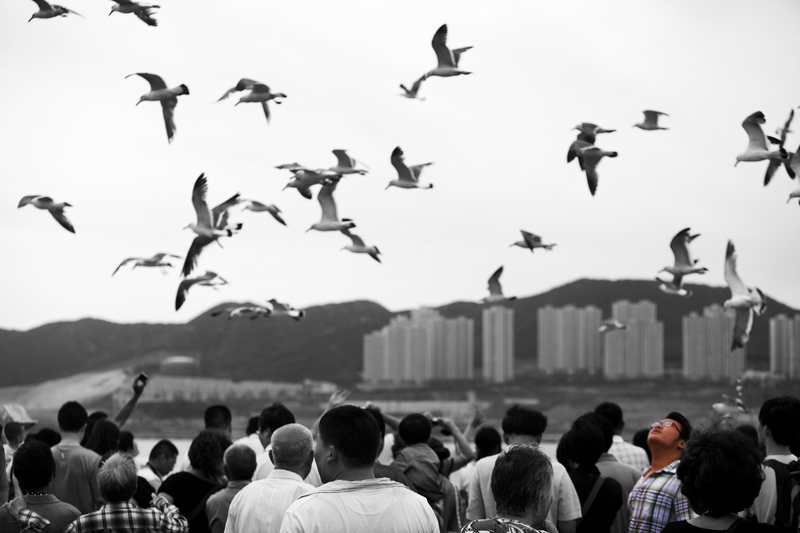 Kongzi’s followers are essentially split into two categories, those who follow his teachings as a philosophy and those who follow his teachings as a true religion. 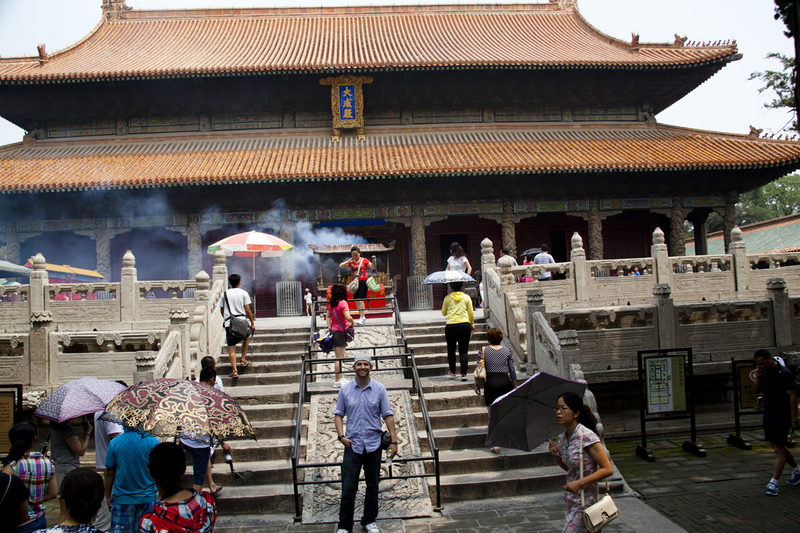 Many of the Confucian temples are for the latter, the religious followers. We were fortunate enough to visit locations that were of each branch. I’ll start with the Confucian temple. People would pray to Kongzi for favors, knowledge, and power. The Confucian temple was one of the most beautiful, serene (once you were out of the main squares) and ancient places I’ve ever been. But, as with many things in China, I was torn in two (yin and yang…); between the beauty of the temple, and the aweful commercialization of the site. I will start with the more positive yin. 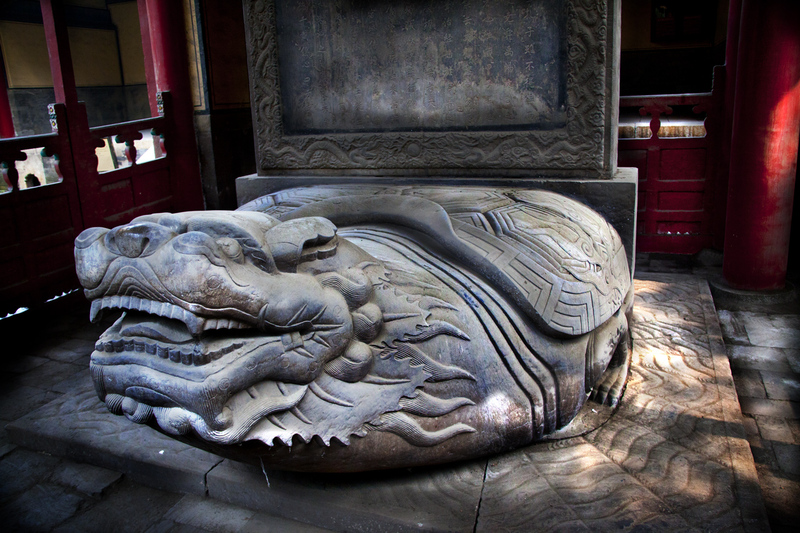 The ancient walls, statues, and walkways were all made of stone carved into giant dragon pillars, chimeras, and 30ft turtles (the younger brother of the dragon, according to our guide). The building roofs are made of stone shingles with dragon, swan, and gargoyle ornaments, also in stone. Ornate stone pillars and wood supports adorn most of the large building entrances. The ‘temple’ is actually a huge ground with multiple giant buildings, courtyards, and stone, lots of stone (see the temple map). There was a stone path that ran through the middle of the temple that was reserved for the emperor, flanked by two side paths for his adivisors. 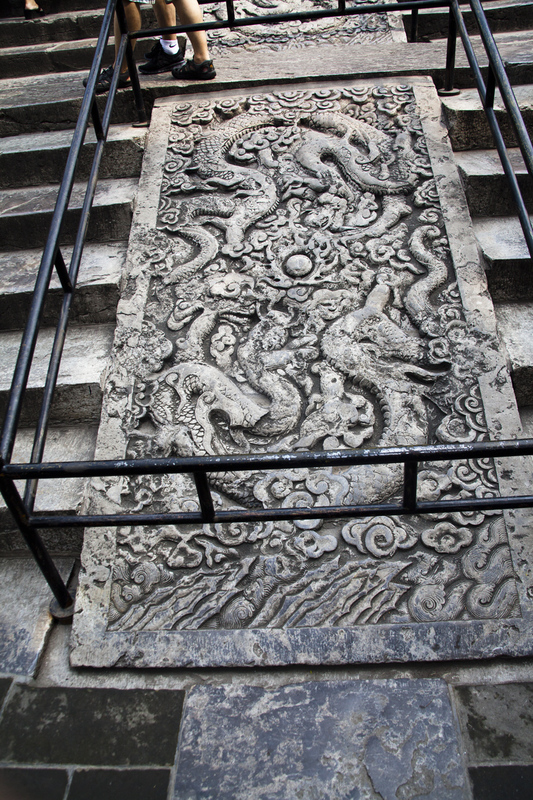 Many of the gates had ornate dragon scenes carved into this path for his highness. This guy was not crazy about being at the temple :). 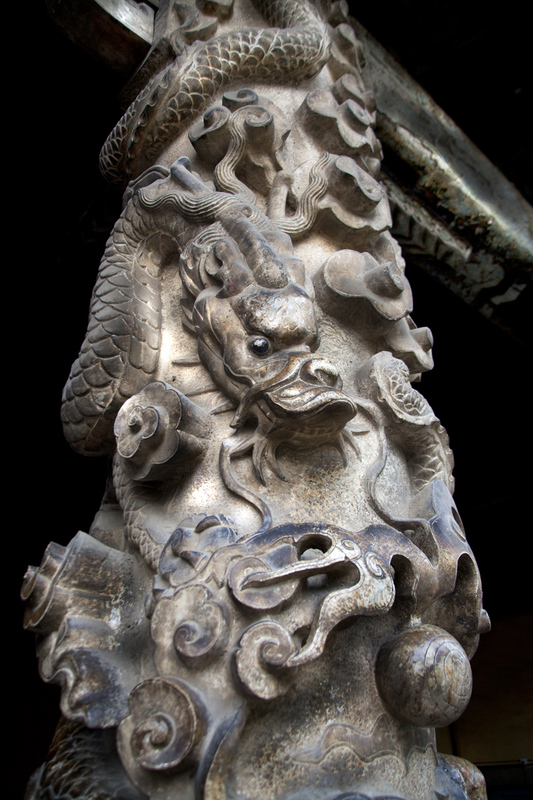 Stone dragon columns at the Confucian temple. Hall on the side of the temple complex. Dragon path for the emperor. Kong family tree, 42 generations on a stone tablet, so roughly 1000 years of family history. The Confucian study center. It was a very peaceful space. Me and a giant statue. It was like lord of the rings! As you walk into the complex, you have to pass through multiple gates that are the result of each Dynasty’s expansion of the complex. 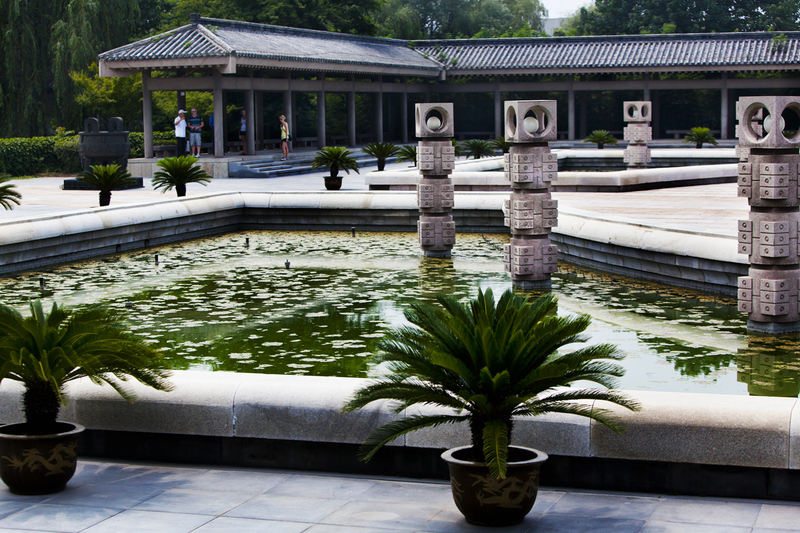 The complex was founded almost immediately after Kongzi’s death in 479 BC by the Duke Ai of the State of Lu so the inner most temple squares are the oldest, expanding outward as Han, Song, Ming, and Qing dynasties expanded. 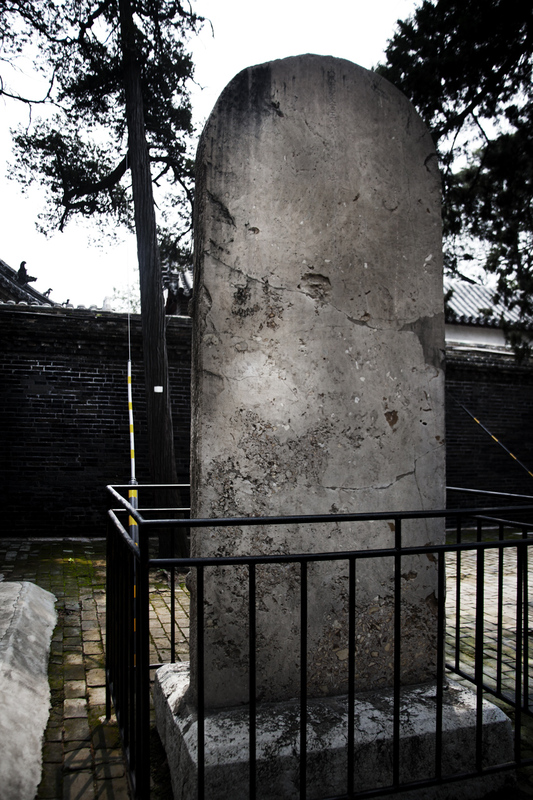 Though only some of the original stones remained as ruins or were re-used (much of the temple was rebuilt in the Ming dynasty), it was difficult to comprehend walking through a 2500-year-old site. Traveling through each successive gate, you couldn’t help but feel as though you were traveling back in time. The huge ope squares between buildings were like forests paved in stony moss. Our guide, ‘Ben,’ told us that the trees in the outer courtyards were ‘not that old, maybe 400 years or more.’ I laughed out loud, “that’s twice the age of my country” I told him. 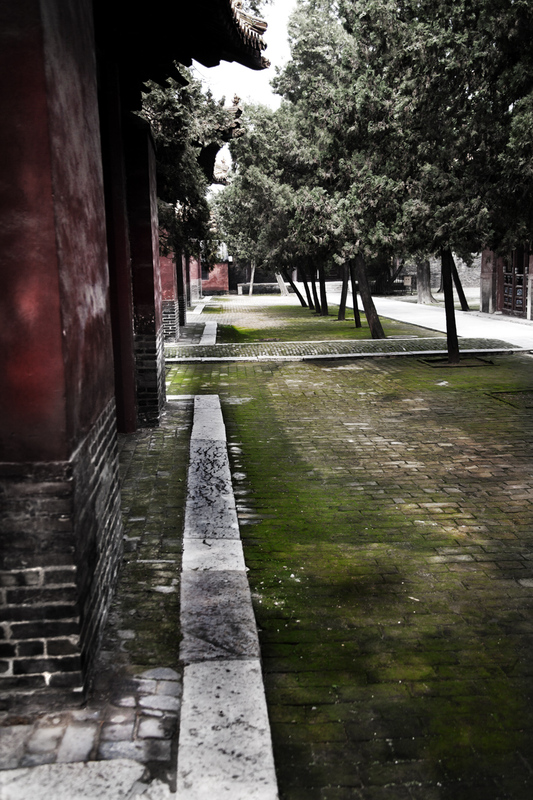 He said that there are some trees in the inner courtyard that are 1200 years old, so not to worry! This is how the Chinese mindset is, they are very aware of their ancient culture and how young the civilizations are around them. 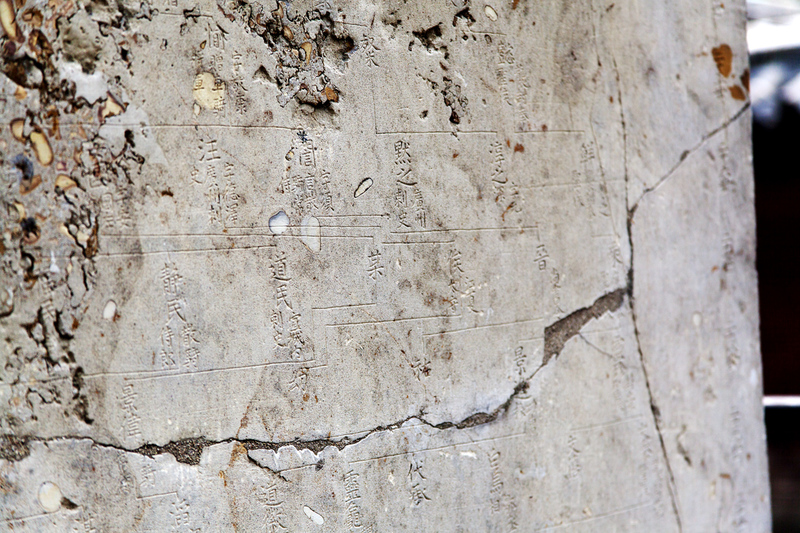 The Kong family has a carved tablet in one of the courtyards that has 42 generations of family tree history, right there in the temple. We calculated that to be roughly 1000 years of family history; the group that stood there at the stone was speechless. It is exceedingly difficult for an American to understand that kind of history. As we were walking amongst the crowds, I noticed a side building that ran the length of one of the bigger squares so I broke off the main group and spent some time admiring the space. The area was dark, almost entirely quiet, and was lit only by natural light casting checkered light on the floor. As I walked, I could imagine strolling the long corridor on during a cool spring morning, 2000 years ago. It was serene. Much of the less traveled squares on the back-side of the complex were like this, I would highly recommend traveling to them to get away from the crowds. The grand temple was something to be admired, it was huge, and had been very well restored. The incents burning out front also added to the atmosphere. Now the yang side of the experience. I could not help but be insulted by the commercialization of the site. There were vending machines placed literally right on the path in the middle of these beautiful courtyards and memorabilia stores inside what once were holy temples. 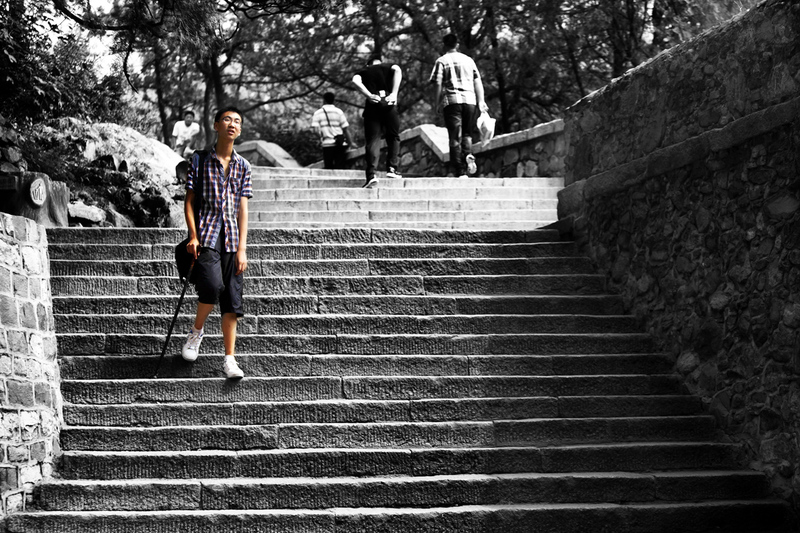 Emperors from powerful dynastic heritages walked these same steps, and now they sell fake statues of them to tourists. Sure we do this in the US, but I would argue we have more responsibility in preservation, authentic restoration, and keeping the experience as original as possible at our historical sites. The other major issue was the noise from both the sheer amount of people, and their guides. Each large tour group of people had their own tour guide, blasting their voice over hand held bullhorns or small wearable PA systems. Imagine 20 bullhorns yelling Chinese at all times; it was more than distracting. My advice, headphones or earplugs are an absolute must if you want the best experience. All over China in the places we have visited, this ruining of cultural sites has offended me so much more than I anticipated. I love these people and their culture, and their history is not just Chinese history, it’s a part of my history, humanity’s history and should be preserved as best as we possibly can. The people seem to have a distinct disregard of the significance of what they have here, real history. I’m sure much of the attitude stems from the Cultural Revolution. On Mao’s orders, the Red Guard was sent throughout the country to destroy temples, burn ancient books, and murder the people that wanted to preserve their ancient culture. It makes me gag, literally. The damage was so extensive that the Chinese government asked the library of Congress to loan them thousands of books because, at the time we had more Chinese literature than did the Chinese themselves. I am confident there are people in China that love this history as much as I have come to, please please help change the temples. Now that that’s out of the way, I’ll turn to the other two sites. 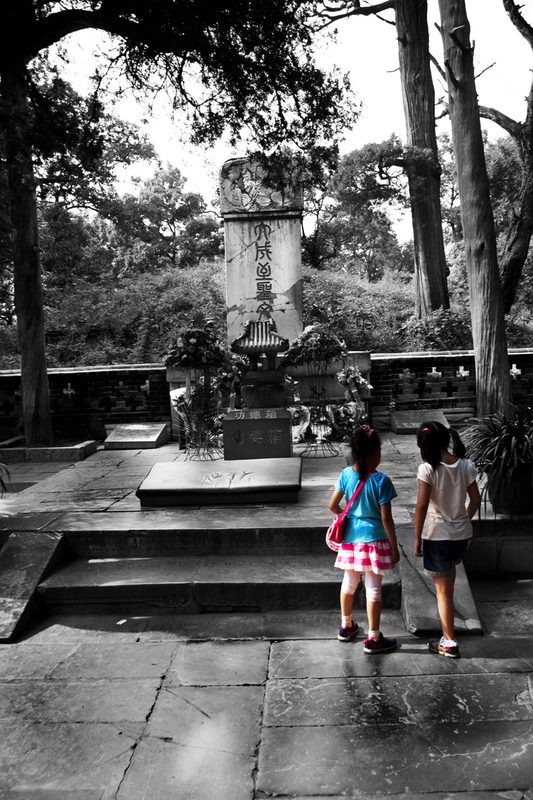 My favorite site we have been on the entire trip hands down was the Confucian cemetery. I loved it. There were much fewer people on the grounds and there was a much greater measure of quiet respectfulness from the people touring the grounds. 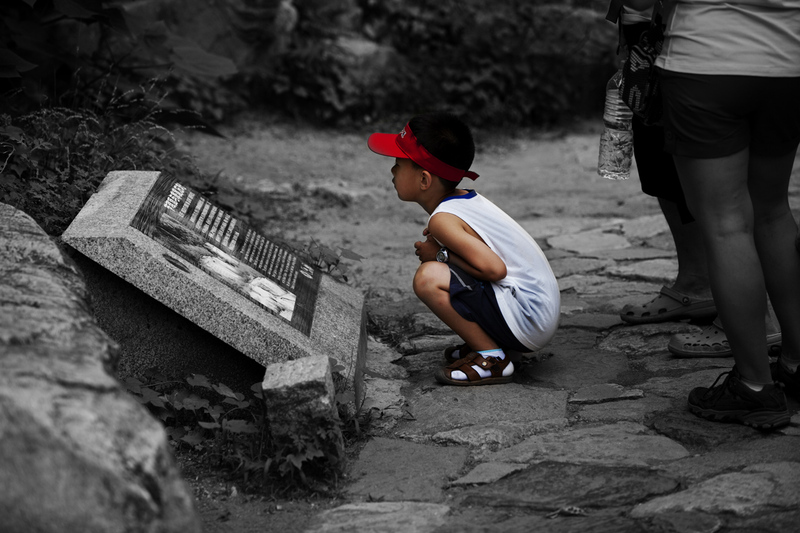 The cemetery is more like a forest, the trees are very old, and the sounds of bird whistles, cicadas, and other animals drown out what little talking there is from visitors. There are very few tombs in the area we walked that I would imagine is because there were very few that were rich enough to afford it. The forest floor is lush, with moss covered paths winding through the forest. 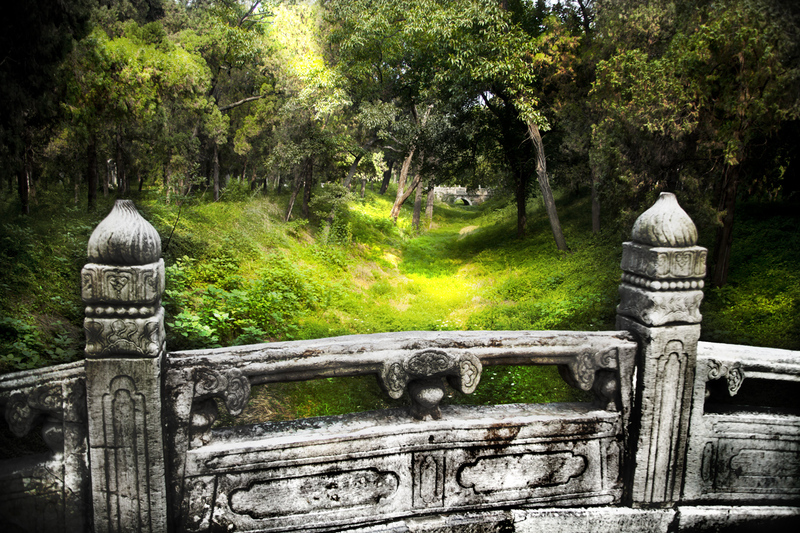 Light glows along the paths (the trees break to allow light in), and as you walk over ancient stone bridges on the long path to Kongzi’s, it’s easy to get lost in the scene. Everything is old and damp and quiet -Mystic would be a good word to describe it. 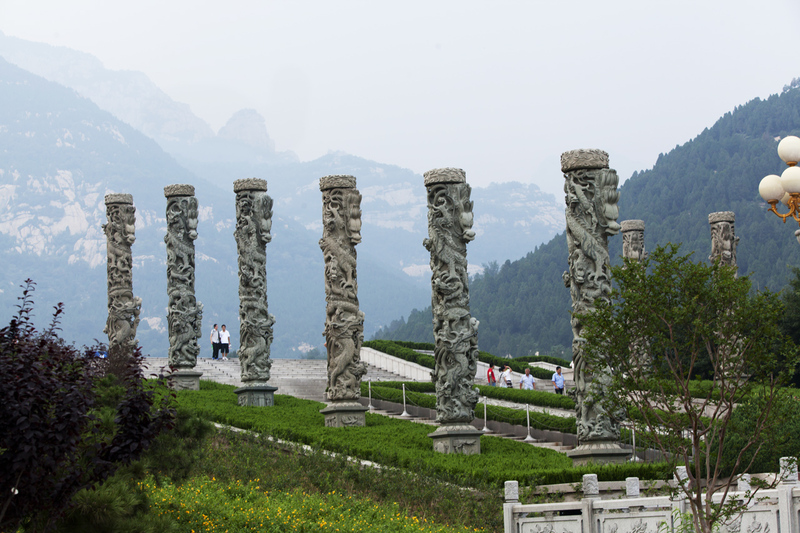 Along the path are 20ft stone statues with swords or scrolls, representing advisors to the Kong family of military and political, respectively. Large gargoyle-like statues pave the path as well. Kongzi’s tomb is not nearly as ornately decorated as one would imagine, as was his wish apparently. The 2500-year-old man is buried directly next to his son, with his grandson’s tomb close ‘so that he can curl one arm around his grandson, and the other he can place on his son’s shoulder,’ a guide said. The last location was the center for Confucian research. The grounds were just enormous with the signature ‘square’ (though it was circular in this case) in the middle of the grand buildings. Along the outskirts of the paths were quiet streams with drooping trees and beautiful flowers. 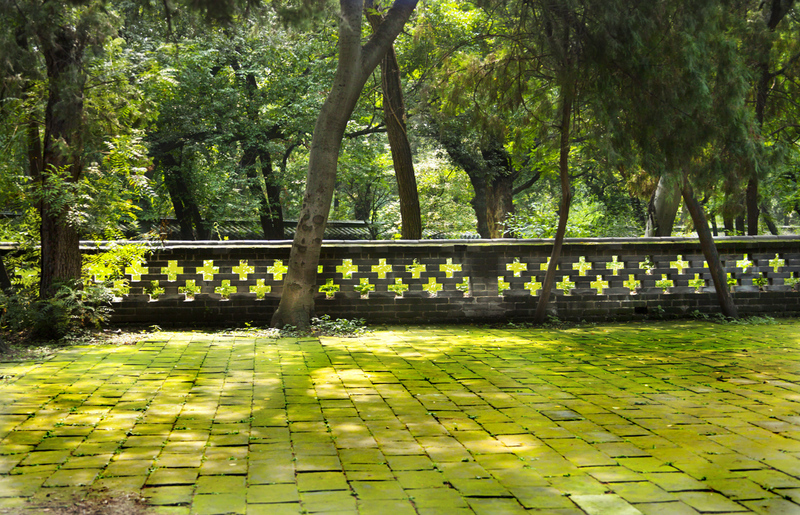 There were also large stone and brass mosaics of Confucian history and teachings. One such tablet had the entire Analects carved in stone down it’s side; it was quite impressive. 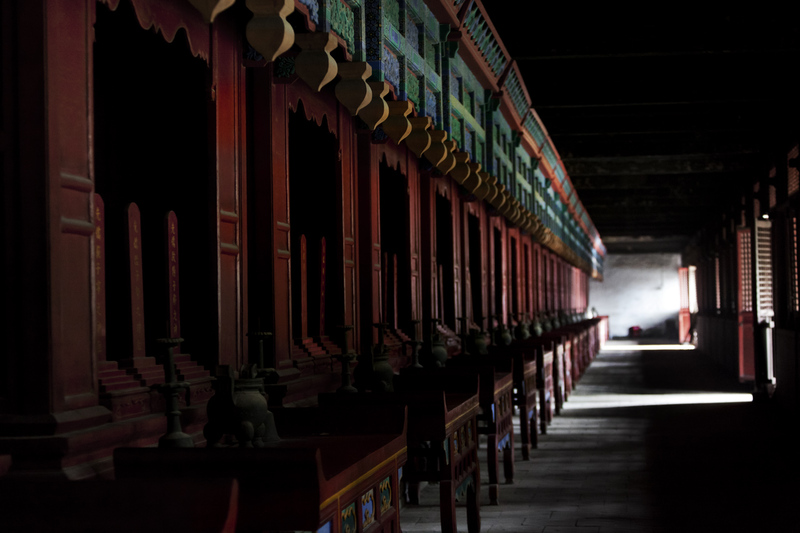 Inside the building were museums that showed Kongzi’s influences not only in Chinese cultures but as well as pictures from temples in areas such as Japan, Korea, Vietnam and Laos. 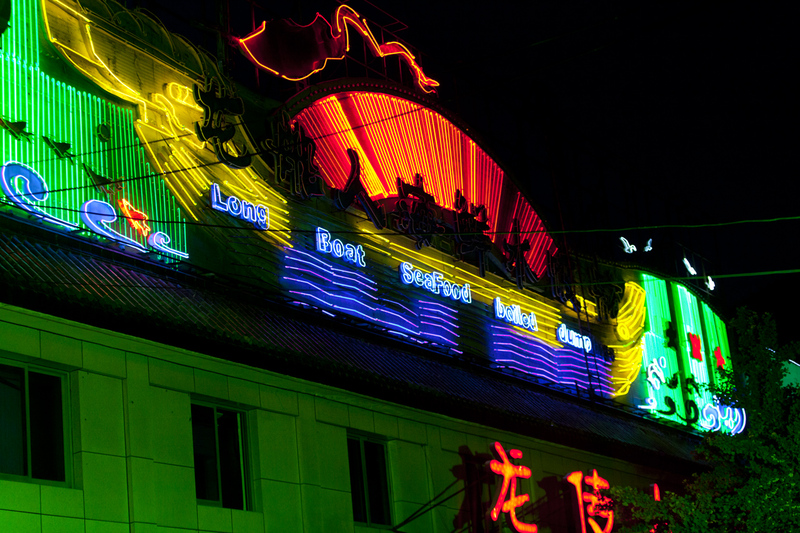 The day ended with a great meal at a local Chinese restaurant. It was a long day but hands down my favorite on the trip so far. Dalian->Yantai ferry and Yantai at night. On the way over the seagulls sit in the boats air envelop which allow them to glide at about arms length on the deck of the ship, it was entertaining for all of us! The babies love Katie with her pale skin, blond hair, and blue eyes. 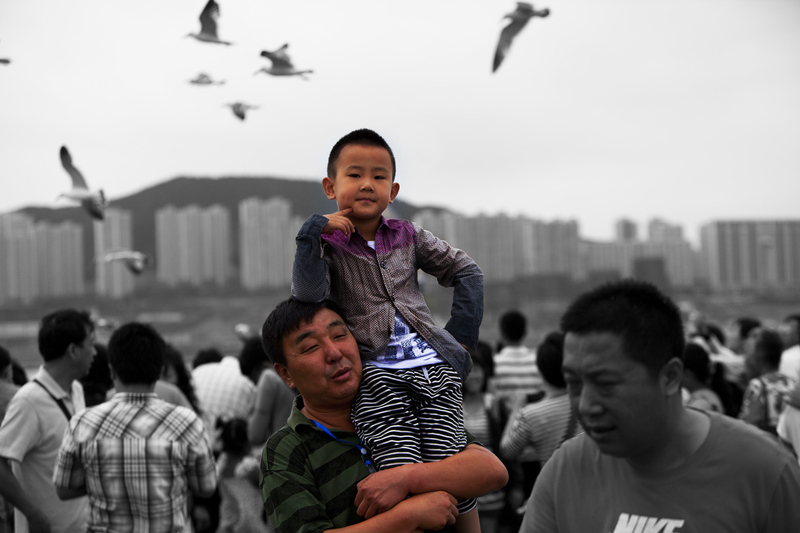 Much like Dalian, the entire city of Yantai is under construction. 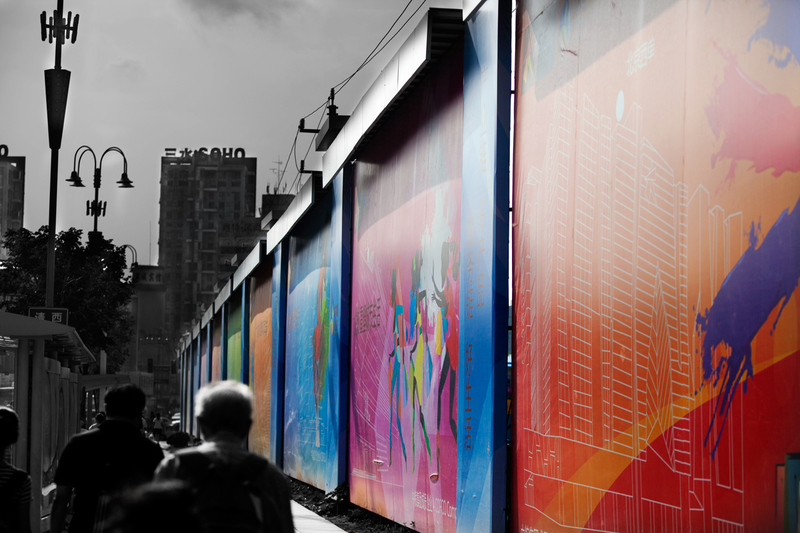 They use the beautiful colored billboards to conceal it.